The Vironomics core is a core facility tailoring our resources to fit your individual project. The Vironomics core operates all assays under good clinical laboratory practices (GCLP), which means we can generate information to support clinical trials and to support FDA approval, but cannot generate information that is reported back to the patient, or be used in treatment decisions. 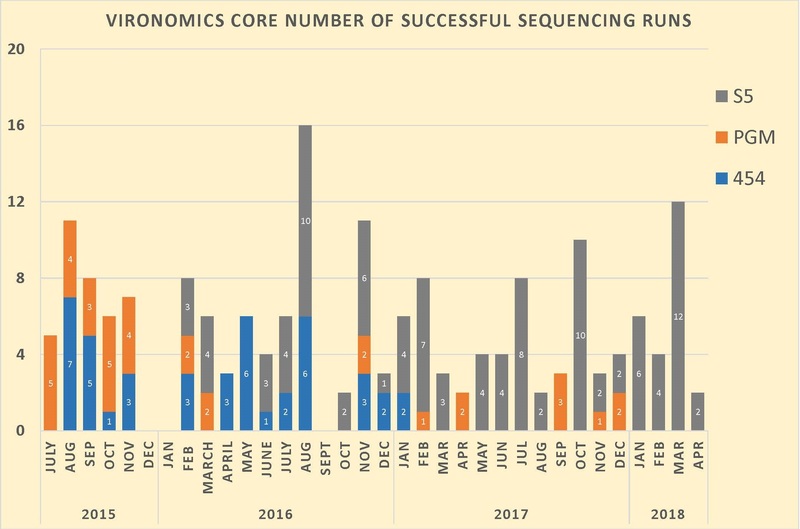 The Vironomics Core currently provides several real-time qPCR arrays for viruses and miRNAs profiling including: KSHV, EBV, HSV1 and HSV2, RRV, HCMV, NFkappaB, Pre-miRNA, and P53response12. The unique automated robotics also enables them to offer custom and commercial real-time PCR assays to clients. The Vironomics Core uses several automated robotics for the large-scale real-time PCR. A Tecan Freedom Evo© is used to set up reactions in a 384-well plate, which is then run by the Roche Lightcycler 480 II©. This is a fast and effective way to amplify samples with RT-qPCR. 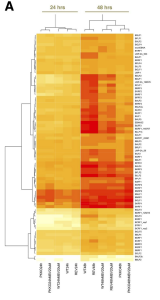 The Vironomics Core facilitates research long-read length next generation sequencing. The sequencers in the core are ideal for longer DNA fragment sequencing with instrument run times of only 24 hours. This is accomplished using Ion GeneStudio S5 Prime System, and companion Ion Torrent Chef. The Ion GeneStudio S5 capable of up to 600bp read lengths and has a maximal output of 130 Million 200 bp reads in 12 hours or 4 human exomes per day. Many clients use the longer reads for large genomes, de novo sequencing, 16S sequencing, long amplicons, etc. Customization is available or take advantage of the current expertise in: whole genome sequencing (WGS), de novo assembly, STR cell line verification, targeted amplicon sequencing, plasmid verification, strand-specific RNAseq, and exome sequencing. The Vironomics Core is led by our Principal Investigator, Dr. Dirk Dittmer, and includes several research staff. Our facilities are located on the 1st floor of the Lineberger Cancer Center (wing parallel with West Dr). The main research focus of the Dittmer lab is understanding viral tumorigenesis, especially that associated with Kaposi’s Sarcoma Herpesvirus (KSHV). A more in-depth description can be found at this link. Location: Lineberger building (red brick), near corner of Manning Dr and West Dr-across from parking deck. 1st floor (floor with large circular atrium with dome overhead). Hallway parallel West Dr. All the way to the end, turn the corner. Room 12-048.